Getting around Prague by bus. 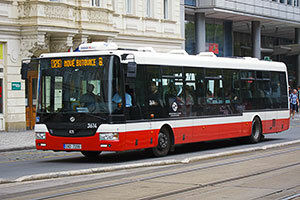 Buses (autobusy) cover the outskirts of Prague and areas where trams or the metro do not run. Daytime buses run from 4:30 a.m. till midnight in 6-8 min. intervals in peak hours, 10-20 min. intervals in the off hours, and 15-30 min. intervals on weekends. Night buses (numbers 501-513) run from around midnight till 4:30 a.m. at 30-60 min. intervals. Bus 119 connects the Prague airport with the Nádraží Veleslavín metro station (line A) and bus 100 connects the aiport with the Zličín station (line B). 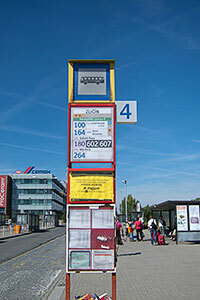 They are both a convenient and cheap way to get to and from the Prague airport. For more details, see Airport - Downtown. The Prague Zoo can be reached by bus 112 that runs from Nádraží Holešovice (metro C) every several minutes. The ride takes 10 minutes and you'll need a regular transport ticket (see Tickets & Passes). You can look up Prague bus schedules and connections at dpp.cz.